A Look at Cupping: Is It Right for Runners? Cupping therapy launched into the limelight after a number of high-profile athletes donned some painful-looking dark circles on their torsos at the 2016 Summer Olympic Games. And while some professionals swear by the effectiveness of this unorthodox treatment, a number of unanswered questions remain for back-of-the-pack runners. What exactly is cupping therapy? Is it painful? And will it benefit the training and recovery of everyday, amateur athletes? A form of traditional Chinese medicine, cupping therapy has been used for thousands of years in areas like China, Egypt and Greece. Its use later spread to parts of Africa and Europe, and today it is used widely as part of massage and chiropractic therapies across the globe. But how exactly is it applied? In ancient times, healers would use anything from animal horns to seashells as suction devices to expel bites, infections or skin lesions from the body. These days, the suction cup is made from bamboo, glass or plastic, and suction is either created through the use of fire or air. In fire cupping, the inside of the cup is briefly heated with fire. This creates suction, which causes the cup to adhere to the skin. 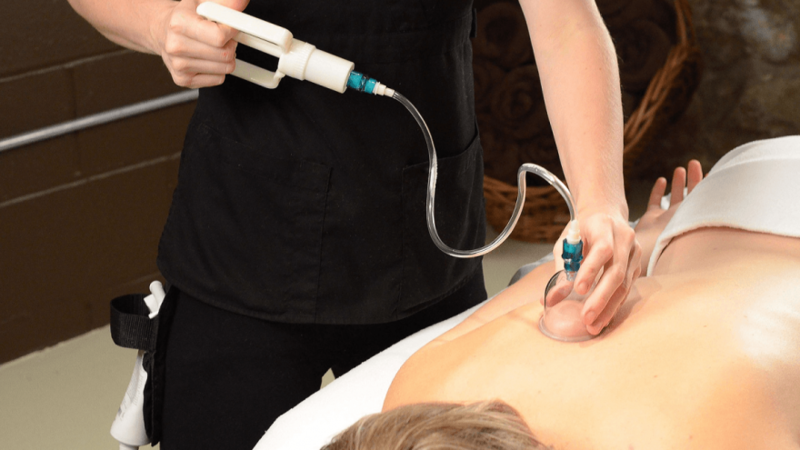 With air cupping, the therapist creates a vacuum inside the cup through mechanical suction before placement on the skin. With stationary cupping, approximately four to six cups are adhered to the skin through suction and left for about 15 to 20 minutes each. This is believed to stimulate local acupuncture points, which improves blood flow to ease up tight muscles, relieve pain and rebalance organ function. This practice is extensively used in traditional Chinese medicine today. Massage cupping, on the other hand, is more commonly used by western therapists. Ample oil is applied to the body to allow cups to glide over the skin after adhesion. This is done in smooth, consistent motions. Massage cupping is believed to release rigid soft tissue, release excess fluids and toxins, loosen connective tissue adhesions and stimulate blood and lymph flow to tense muscles. Some western practitioners apply both stationary and massage cupping therapy. Cupping therapy can be applied almost anywhere on the body, including the feet and the face. It is, however, most commonly used on the back, neck and shoulders. A cupping session therapy normally lasts between 15 and 60 minutes in total, and can cost anything from US$30 to US$150 per session. These training-specific perks are believed to be brought about through increased muscle endurance, improved circulation and improved lymph drainage. But what does the research say? Does science provide undisputable proof regarding the effectiveness of cupping? To date, not in a convincing way, no. Researchers of the Korea Institute of Oriental Medicine conducted a systematic overview of the effectiveness of cupping in the treatment of a variety of ailments in 2011. This study concluded that “the effectiveness of cupping has been demonstrated only as a treatment for pain, and even for this indication doubts remain”. And although a number of other, smaller studies do point to the potential moderate pain relief abilities of cupping, additional, more detailed research is required in this regard. Stationary cupping is known for leaving dark rings and circles on treated areas. These marks form as a result of the rupturing of tiny capillaries near the skin. And while it appears painful, many clients likens the sensation caused by cupping to a slight pinch. Treatments are also always done to toleration of the client, and most are said to experience only mild levels of discomfort. The skin might also feel slightly sensitive after each treatment. Some marks left by cupping are darker than others, and it is generally believed that the darker the circle, the more effective the cupping point. Marks usually fade after approximately one week, but the results of cupping therapy are believed to be both immediate and lasting. “Bruised back from cupping” by Amy Selleck. Licensed under CC BY 2.0. But do these marks (or cupping, for that matter) have any lasting, negative side-effects? According to Jordan D. Metzl, M.D., it’s not likely. “Cupping seems to help with muscle release, and generally is quite safe,” says Metzl. It does, however, go without saying that strict safety, hygienic and infection control measures have to be adhered to when applying cupping therapy. Rigorous training of cupping therapists is also vital. Why? Well, a number of cases of burns, from the spillage of flaming alcohol on clients mid-treatment, have been reported. And although not common, such events occur surprisingly often. Practitioners also recommend that you wait until the marks left by one cupping session disappears before undergoing another one. So should you follow in the footsteps of Phelps and others and give cupping a go? It’s entirely up to you. If you have the money to spend and you feel that it does bring pain relief, then go for it. Just be sure to find a reputable, well-trained therapist that strictly adheres to all safety, hygienic and infection control measures. If, on the other hand, you’ve never tried it and you’re in search of a proven, effective addition to your recovery strategy, you might be better off searching elsewhere.